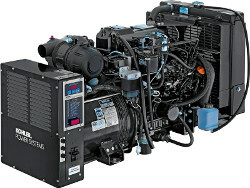 This generator delivers dependable, uninterrupted power that is as pleasing to the user as it is to the environment. The DCA-125USJ operates at a calming 62dBA full load at 23 feet and has a standby output of 137kVA/110kW and prime output of 125kVA/100kW. This electric-starting unit operates with the muscle of a 150-horsepower John Deere diesel engine that features improved fuel efficiency and voltage regulation of 1 percent no load to full load. Site visits, load analysis's, and detailed proposals help our customers with their power system installations. Let us provide you with the same. Turn key installations, electrical, permits, delivery, rigging, start up, and factory recommended maintenance schedule. See our recent installs in our project gallery. We provide design build services for your system, diesel base tank, sound housings, city water cooled applications, transfer switches and remote monitoring.